South Elkins was the location of two junctions where WM branchlines joined the mainline. 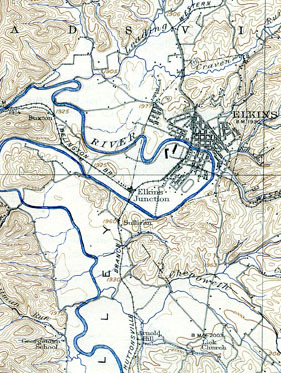 Elkins Junction was about one mile south of the Tygart River bridge and was where the Huttonsville and Belington lines met. The C&I line from Durbin joined on a wye just south of the Tygart River bridge, but this junction had no name on the 1919 railroad valuation map. In fact, the Belington line is noted as the 'Main Line', while the others are marked as Huttonsville Branch and Durbin Branch. the rugged mountains that form the headwaters of the Tygart, Elk, and Shavers Fork of the Cheat rivers. Lumber operations at Dailey, Mill Creek and Huttonsville kept this a busy branch. The narrow gauge Valley River Railroad interchanged at Huttonsville and Mill Creek. The Belington Branch followed the Tygart River north seventeen miles to Belington. This area was rich in coal deposits and offered a connection with the Baltimore & Ohio Railroad and the Belington & Beaver Creek, for interchange. The B&BC served some mines in Weaver, a few miles from Belington. The last branch built was the most extensive. The Coal & Iron line was originally built as a separate railroad and connected Elkins with Durbin, West Virginia, a distance of forty-seven miles. From Elkins, the line headed east and crossed over into the Shavers Fork watershed. It followed this river south to a point just beyond Bemis, then crossed the Shavers Fork and swung back north on the other side gaining elevation. The rails made another sharp turn east and went through a tunnel to reach the Glady Fork of the Cheat, which it followed south to the headwaters at Lynn Divide. The rails then followed the West Fork of the Greenbrier River to Durbin. Many sawmills set up along the C&I line and provided the railroad with a steady business of cut lumber, pulp, and other items into the mid-teens. A rich seam of coal was discovered near Bemis in the mid-1920’s, which provided even more car loadings for this line. In the mid-1920’s, the Greenbrier, Cheat & Elk Railroad made a connection on the C&I near Bemis. The GC&E was owned by West Virginia Pulp and Paper, a major lumber company of that day. Traffic ebbed and flowed from these branches, but much of the car loadings came through Elkins. The amount of freight, plus the locomotive facilities and car repair shops made Elkins a bustling railroad town. In 1902, Henry Gassaway Davis and his partners began the sale process of the West Virginia Central & Pittsburg to a group of investors known as the Fuller Syndicate. By the end of 1905, the WVC&P ended up with the Gould Syndicate, which was buying up railroads across the country to create a transcontinental rail line owned by one company. The Gould Syndicate, led by rail baron George Gould, had previously bought the Western Maryland Railway that stretched from Baltimore to Hagerstown, Maryland. They now folded the WVC&P into the Western Maryland and connected the two parts with an extensive project along the Potomac River. But I digress. The overall scope and history of the Western Maryland Railway is quite interesting, and much if it has captured my interest as a rail enthusiast. But my focus is on Elkins, West Virginia. The details presented here give you a good picture of the Elkins rail activity. But we do need to add one more connection in South Elkins. Just before Davis sold the West Virginia Central & Pittsburg, he began building the Coal & Coke Railroad that joined Elkins and Charleston. The Coal & Coke built a separate connection into Elkins that paralleled much of the WM branch from Belington. The connection in South Elkins was just south of the Tygart Valley River bridge and on the west side of the tracks opposite the wye to the C&I line. The Coal & Coke was bought by the Baltimore & Ohio in the early 1920's. The South Elkins story continues as we review the inspiration to model a portion of Elkins.